And just like that, it’s the end of January. 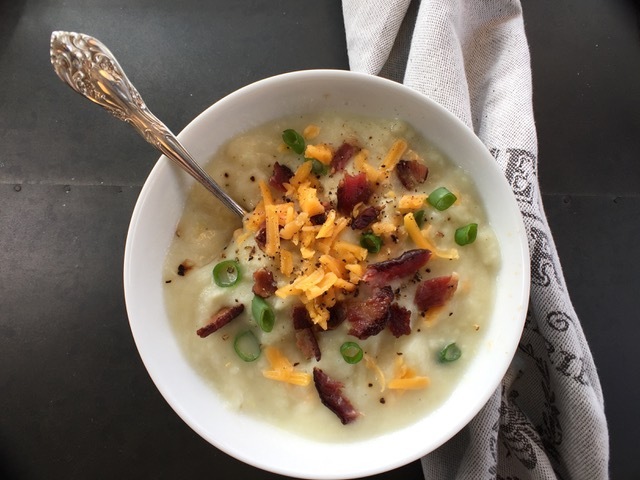 Make a nice, warm, better for you bowl of Loaded Baked Potato Soup. It’s better for you because there’s a vegetable hiding in there, but no one will be the wiser. It’s fast, it’s easy, and it uses up some ingredients that might otherwise go to waste, and zero waste is not only thrifty, it’s smart. Remember those potato skins we made earlier? This is what you’re going to do with the scooped-out insides. And the white part of the green onion that just seems to hang out in your vegetable drawer? We’re using that, too. And we’re adding a bag of frozen, riced cauliflower to this soup to make it lighter, and healthier. It adds body and thickens the soup without having to use flour or cream, and while you’re getting a sneaky serving of vegetables, you’re also getting some bonus vitamins and fiber. Light sour cream gives this soup plenty of velvety creaminess and that unmistakable stuffed baked potato flavor. Let’s send National Soup Month out on a good note. Warm up with something that’s not just good, but good for you, too. In a large stockpot or dutch oven, gently melt butter over low heat. Add onion and cook until softened, stirring occasionally, about 5 minutes. Add garlic and continue to cook and stir until garlic becomes lightly golden, a few minutes more. Add frozen cauliflower and chicken broth and cook over medium heat until mixture begins to bubble. Reduce heat to low and continue to cook, stirring occasionally, until cauliflower softens about 5 – 7 minutes more. Add potato and cook, stirring to combine, until heated through. Transfer to blender, reserving 3/4 cup for texture. Add sour cream and blend until smooth adding a small amount of water, or milk, to reach desired consistency. Add reserved potato mixture and season with salt and freshly ground black pepper to taste. Spoon into bowls and garnish with cheddar cheese, sliced green onion and crumbled bacon.